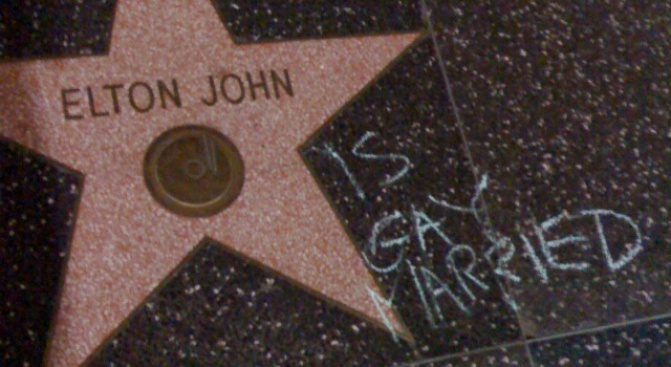 Elton John may be married but was he married in the state of California before Prop. 8 was passed? San Francisco may not be the gayest city in the nation but that won't stop the City from celebrating some of its brightest stars. A group of San Francisco residents and business owners are pushing the City to install the names of gay and lesbian heroes on the sidewalk along a stretch of Market Street, according to the San Francisco Chronicle. The memorial would be similar to what Hollywood has with its celebrity Walk of Fame and eliminate the need for the Sisters of Perpetual Indulgence from having to tag those Hollywood stars. The memorial would stretch on Market Street from Octavia Boulevard to Castro Street and down Castro to 19th Street. The group has chosen 20 names that would be the first to be memorialized on the Rainbow Honor Walk. Names include the likes of Allen Ginsberg and Oscar Wilde. Famed politician Harvey Milk did not make the initial cut. The idea still has to be approved by the Civic Arts Commission. If approved, the plaques could be in the ground by the end of the year.